This is an interesting item. It is an exercise bike that worked with the Super Nintendo. There were two games specially designed: Exertainment Mountain Bike Rally and the Exertainment Mountain Bike Rally/Speed Racer combo cart. This bike can still be purchased on various websites for about $2000 US. A Lifecycle trainer, the heart of the Exertainment interactive fitness system. It's up-close, it's personal and best of all, it lets you decide what and how to watch TV, Lifecycle program screen or video game, full-screen or picture-in-picture. This all happens while riding a Lifecycle 9XS, a new concept derived from the most famous, reliable fitness bike worldwide. That's the idea behind the Exertainment Interactive Fitness System. The Exertainment system features proven programs: Hill, Random, Manual, 12 Speed Race, Fit Test, and 13 different effort levels, including one especially for those who are deconditioned or just starting out. Users get feedback for ongoing motivation: elapsed time, distance, calories burned, and speed... a complete summary of their results is displayed. 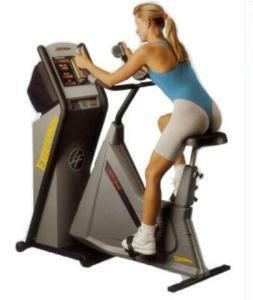 Key Features- The Exertainment system is the first and only combination cycle trainer and Super Nintendo System. It's totally interactive so users actually become a part of the on-screen action. - Cable, satellite and antenna ready. - Audio option of headphones or external speaker. - Triathalon handlebars with built-in game controls. - Pantented springless molded seat. - L: 56" x W: 29" H: 64"
Images of the the controllers. These are non-standard snes controller and clamped on the handles of the exercise bike.